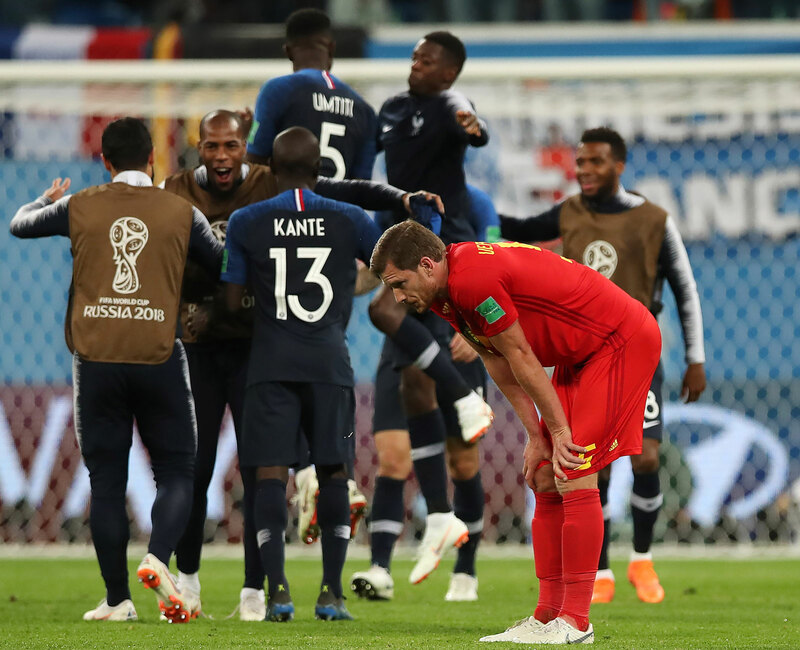 A generation-defining win over Brazil was followed with a semifinal loss to France, altering Belgium's trophy outlook significantly for a cast of stars any nation would be grateful to boast. ST. PETERSBURG, Russia – The nature of international tournaments is that perspective changes quickly. Four days ago, Belgium’s golden generation beat Brazil and looked as though it might at last be about to deliver on its immense promise. On Tuesday, it lost to France 1-0 in the World Cup semifinal, and now there is a clear sense of the clock ticking. The window of opportunity for a nation such as Belgium, from which the flow of talent isn’t constant, is narrow, and the sense, rather suddenly, is that for this team it is closing. The margins are desperately fine. Belgium required a heroic comeback vs. Japan to reach the quarterfinals; it could have lost to Brazil in Kazan; and it could have won here. While France defended superbly, it still required a number of fine saves from Hugo Lloris to keep Belgium out. One from Toby Alderweireld's blast in the first half, diving full length to his right and clawing the ball away, was exceptional. But then Thibaut Courtois had had an equally good game against Brazil and also made several saves here. Martinez again made a tactical switch, his willingness to tinker both a surprise and a strength. The 4-3-3 he had used in the thrilling win over Brazil in Kazan remained, but with Nacer Chadli used at right back in place of the suspended Thomas Meunier, Mousa Dembele in Chadli’s place in midfield and Kevin De Bruyne used on the right rather than as a false nine. For a while it seemed to be working. Belgium matched the natural skew in the French side, Jan Vertonghen staying deep at left back to combat the extreme pace of Kylian Mbappe, while Chadli, up against the much more defensive Blaise Matuidi, was able to get forward. Time and again his combinations with De Bruyne resulted in crossing opportunities early on but time and again he failed to pick out either Romelu Lukaku in the box or Marouane Fellaini making late runs. The question mark about Martinez’s management has always been his capacity to organize a defense. Belgium has conceded five goals in the tournament, three of them from set plays, but Martinez was adamant that was not a problem. Slowly the gaps were plugged. Defending deep, France denied Belgium the space it had relished on the counter against Brazil. Martinez had described that fixture as Belgium’s match of the World Cup, and perhaps that was part of the problem. Having gone behind, Belgium was unable to raise itself again, unable to find the energy, physical or emotional, to trouble France. The golden generation tag only increases the pressure. Lukaku, 25, was the only member of the starting XI under 27. By the time the Euros come round in 2020, seven of them will be over 30. The bench here offered some hope–Yannick Carrasco is 25, Youri Tielemans 21–but only some. Time is closing in, and as plenty of golden generations of the past, from Portugal to England to the Ivory Coast, have discovered, the sense of hope and potential slipping away can lead to desperation, to snatching at opportunities. The knowledge that "if not now then maybe never" is a terrible burden to bear. Some golden generations splutter and cough and, sealed in a bubble of entitlement, never come close to delivering. Some never find a structure that turns their raw talent into something cohesive. Belgium under Marc Wilmots threatened to fall into that latter category. Martinez’s flexibility, though, at least gave them a taste of glory, a sense of what it is to take on the best and win. If it has nothing else from this generation–and there is one tournament still to go, maybe even two before this generation yields to another–Belgium will always have Kazan.